The interval at the end of a long-distance trek can be a curious time in several senses. It is curious or peculiar because it is the time of not-walking following a long time of walking. Daily rhythms and concerns require new calibrating, infinite adjustment. It is also a time that requires curiosity, a questioning of what has just taken place. Of course many people finish a trek and find themselves immediately thrust back into quotidian, non-walking life without the opportunity for reflection, for necessary curiosity. Instead there is a quick and often intense celebration (think of drunken revels in Millinocket after the Appalachian Trail). After each of my recent treks, I’ve been fortunate to have time– actually I’ve aggressively claimed it so as not to waste the moment of the end–to prolong it so it thickens and stabilizes. I had a week on Stewart Island after my nearly 4 month, 3000 km walk of New Zealand’s Te Araroa, necessary to rest and heal physically but also to think. After the Annapurna circuit I had several days in Pokhara, just wandering the city. On reaching Santiago on the Camino, I then found time and nourishment in A Coruna and Muxia. The second half of the Trans-Swiss trail makes a straight line toward Milan, so that visit had a sense of inevitability. The interval is a place to breathe, to catch up on neglected obligations (writing and revising, composing letters and emails), and experience something like boredom. I use that term deliberately, not to signal ennui or laziness, but instead the necessity to avoid sightseeing, to step out of obligatory tourism and make a space for the thinking of non-walking. 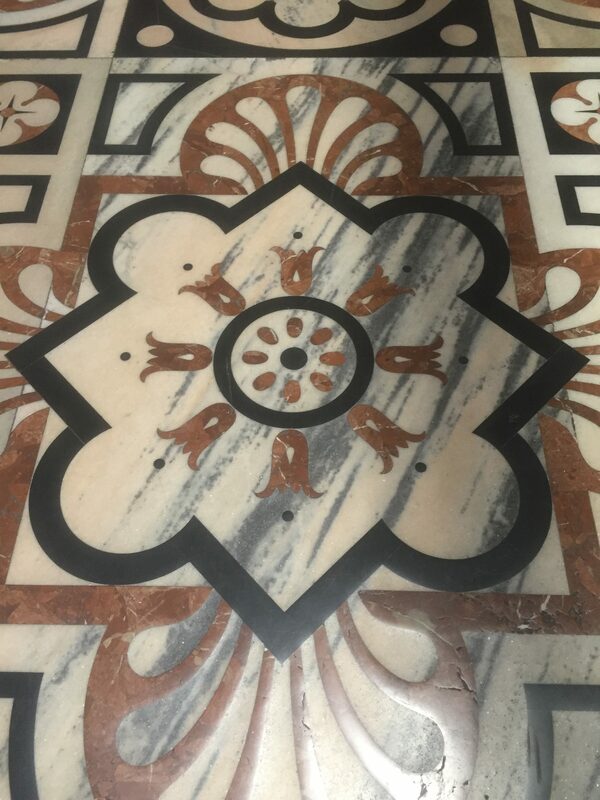 Of course I have visited the Duomo, seen Da Vinci’s Last Supper, toured the castle (and perhaps should make the pilgrimage to San Siro), but also have taken the time to do nothing — to celebrate the thinking that such indolence provides and produces. Many of the essays in this blog have been contemplations of time, usually walking time, but other intervals, other hiatuses, are something to treasure. Walkers find themselves in the middle of spaces, the in-between that is inter-esse (interesting), but those same treks create gaps in time which are equally important as they too make viewpoints as well as continuous ever expanding moments. Rather than boisterous celebration, endings need careful assimilation, quiet prolonging. The last day on a long-distance trek is obviously one of mixed emotions. The trail has been home for a month or more, you are in a particular rhythm that is comfortable, and the non-walking life never holds much appeal. Nevertheless, there usually is some need for rest and refueling (I’m 10-15 lbs. (or 7 kg) below my normal weight), and of course there is the sense of accomplishment that comes with completion. So it is a day you want to be over while you try to savor every moment. Like yesterday, this one started with a long, hot, steep climb up from Brusino. I almost never stop, even to rest, on an ascent, always trying to keep up the momentum, but today about halfway up, I just sat on a rock and looked out over the lake below and listening to music. I was glad a hiker came down and roused me from my reverie, or I might not have finished. After the peak, there was a long fairly smooth track into Mendrisio. A large, undistinguished industrial town and, at least according to one guide, the actual end of the T-ST (the #2 signposts seem to have stopped there). I rested there briefly, then pushed on to Chiasso, a town right on the Italian border. There in the city square they had a huge outdoor TV screen set up with row upon row of chairs, showing the Eurocup games. My hotel room window looks directly out onto the square and the screen, so my end-of-the-trail celebration will mingle with the celebration of fans watching the Italy-Belgium game. I doubt I will sleep early tonight. Sometimes on American long trails, people arrange transportation support so they can hike a stretch without a full pack. It’s called slack-packing, something I try to avoid as carrying the pack is very much part of walking. 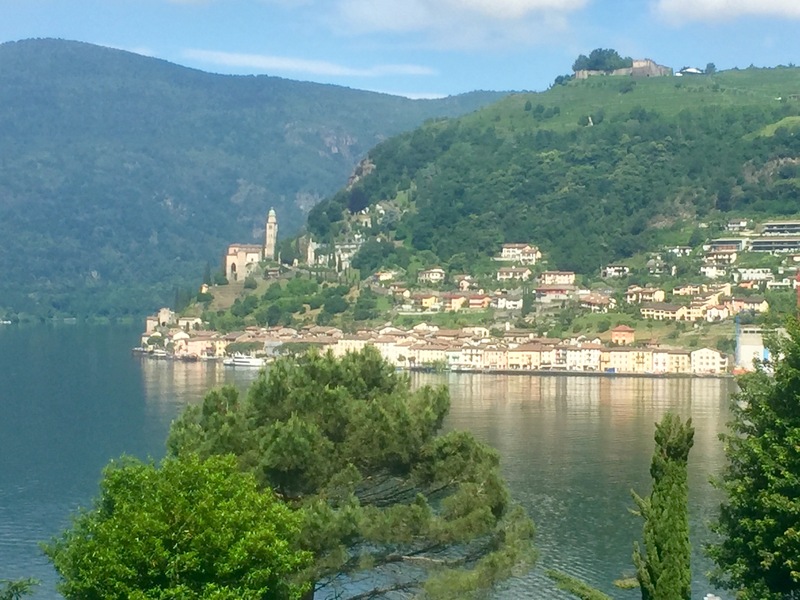 Today however, I had a short but very steep leg of the Trans-Swiss Trail, starting in Lugano and ending at Morcote, a tiny village at the tip of a peninsula. Continuing on requires a boat ride across the lake to Brusino. The same boat returns to Lugano, so I decided to leave my pack at the hotel and return by boat in the evening. G–, a Camino peregrino who lives in Milan, took the morning train up for a day hike, and what a hike it was. The day started cloudy, but soon the sun burned through. The temperature and humidity climbed. In this past year of backpacking, I’ve been mostly walking in springtime, but it is now summer in Ticino. The first part of the trail went up the steps alongside a cable-car–for a very long time. By the time it veered off to switchback through the woods, I was completely drenched with sweat. I thought of those many days of soaking wet hiking on the Appalachian Trail in mid-summer. It took several hours to reach to peak above Lugano only to see dozens of tourists looking fairly cool and fresh, wandering the platform by the mountaintop restaurant. Of course they had ridden the cable-car. I’m just glad it did not pass us on the way up as I might have had to resort to the Mount Washington tradition of mooning of the steam-train passengers on their way up. From the peak, the trail followed the ridge for about 8 km, occasionally passing through beautiful mountain villages, until later in the afternoon when it became steps down–steps that seemed an eternity. 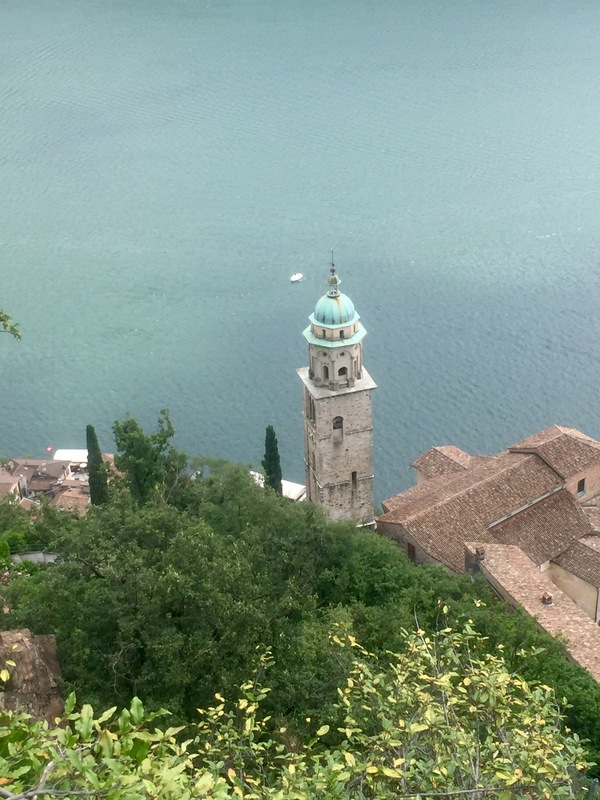 On the ridge just above Morcote is a magnificent church tower and chapel. As it was Sunday, the doors were open so the path went straight through, coming out by the cemetery before descending to the lake-level town, where we had just enough time for cold drinks and a snack before catching the boat back to Lugano. It was the most beautiful day I have had on the Trans-Swiss trail. A word about the Restaurante Vedeggio in Isone. I have met so many friendly accommodating people on my walkabout, but Daniela and her staff were amazing. The restaurant was full of Isone soldiers (there is a base there) and some locals, but they made every effort to make me comfortable. They kept bringing meatballs on toothpicks, bread with cheese, ham, sardines. They made a special main meal of pasta, pesto, cheese and vegetables. Very plain but delicious. They asked if I wanted dessert and when I said no, she brought out a local cake– sort of a light brownie with peanuts– the cook had just made. It was all repeated at breakfast–just one of those times when the place was just a good place to be. It even made the morning walk out in the rain positive. Sorry to say that mood only lasted until the trail decided to cut up through an unmowed (hip high) soaking wet pasture. Not the best way to start a trek. After a pretty squishy hour or so, I found myself up on a ridge in a beech forest looking down on the clouds in the valley. I stopped cussing the trail builders when they settled into transverse path– the kind Bennett and I call “Shenandoah.” It was most of the way up the ridge and ran level horizontally. Like in the Virginia Shenadoahs, it would follow the ridge into the gorges where the freshets, full from last night’s rain, crossed the path filling it with rushing water. A little dance across the stones and once again, the path circumscribed a long level loop to the next water. Late morning those loops brought me closer to the gunshots I heard earlier in the day. My initial assumption was there were hunters nearby. It was Saturday and the sportsmen were out. As the shots intensified, I thought perhaps there were some military maneuvers going on, which prompted me to get out the ugly hat. When I started New Zealand’s Te Araroa, I bought a kiwi bush hat. Oilskin, broad brimmed, perfect for the rain I experienced daily. When I didn’t need to wear it (it was hot), I would hook it to a carabiner on my backpack. One day while descending through some dense gorse, it was stripped off. I only missed it later in the day, too late to try to retrieve it. The next day I found myself in a town with a sport store and bought a running hat– very light, cool, and dried fast. It was the perfect hat, so the very next day, while crossing a farm I was not supposed to be on, I climbed a ridge and was hit full force with some of that New Zealand wind. I tucked my new perfect hat into my belt and hastily descended to get out of the wind and away from the trespass I was committing. On arriving in town, I discovered that new hat was now gone–not even 24 hours use out of it. The town had a sports store, actually a hunting store, which sold ugly hats. They are well-made and functional. The fabric is light and breathes, and the bill is split symmetrically so it easily folds and fits into a back pocket. The problem is that it is a bright blue camo pattern. Without doubt the ugliest hat I’ve ever seen (unless you are a fan of “Duck Dynasty”). The owner pushed a bit, noting that I was entering into a hunting district and needed high visibility (I did encounter many hunters on both islands). I bought it, probably on the assumption that I would soon lose it like all the others. Well, today (7 months later) I could still pull out the ugly hat, placing it squarely on my head so the trigger happy gun owners just down the ridge would, I hope, see me. Before long, the American in the blue camo hat passed the shooting club where dozens of breached shotguns lay on tables while the members opened boxes of more shells. In another 100 yards, the hat returned to my pocket. As the day progressed the path moved inexorably closer to Lugano. The ridges soon had what were clearly weekend homes, but the trail also worked its way through some amazing birch forests. It is not just the bark and shape of the trunks. 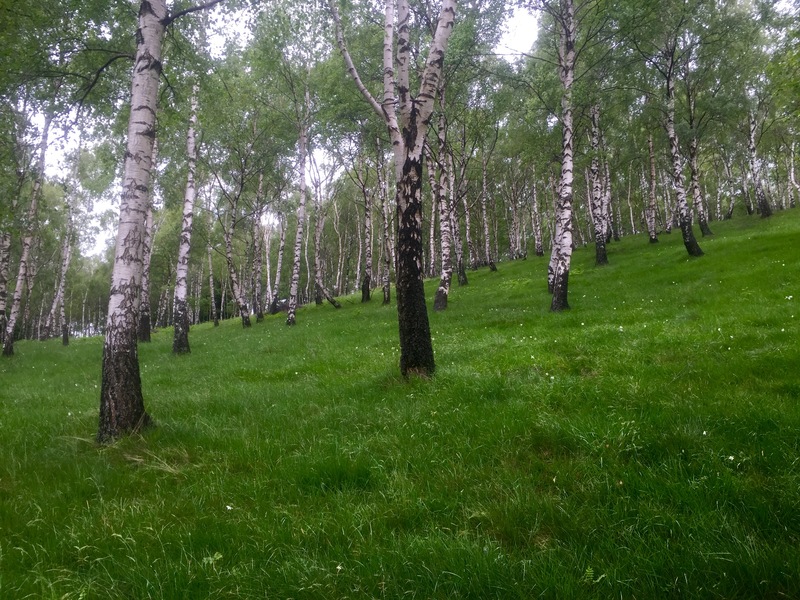 The leaves of birch trees change the light of the forest in an indescribable way. Before long though, the path became sidewalk and the suburbs of the city. On gaining the main square I found some sort of rural, traditional dress/dance/sing/eat thing going on. Lots of very large people roaming the streets in almost incomprehensible clothing. The dancing and the singing were fascinating, but as the afternoon wore on, so did the beer. Nothing like a drunken 18th century cosplay crowd. Of course everyone’s good humor was also stoked by Switzerland winning their first round of the Euro cup. Lugano, the city is how I remember from visiting many years ago. Now to plot out the end of the Trans-Swiss Trail. Today I invoke the excessive mileage, short blog-post rule. I wanted to position myself to get into Lugano tomorrow, and the first 20 km was flat, so I did 36 km with the longest climb (except for Gotthardo pass) of the whole trek. In other words, ahhm beat. Given that the first two thirds was through a heavily industrialized area– the Ticino river basin– it was a good hike hidden in the trees next to the swift river, but near Arbedo it became the backside of a concrete plant, then just wound through the large town of Bellinzona and its suburbs. I kept looking up at the range to the east, hoping the trail did not go over it, but of course it did. So at about 27 km for the day, I started climbing and a couple of hours later made it to the ridge top, confirming an observation Bennett made weeks earlier. When you have a tough climb up through woods to a ridge top, the first thing you will see (or hear) are cows in a pasture. I emerged from the birch forest to the clanging of cowbells and greeted by a dairyman driving his herd, then a long switch backing trek down to Isone, a really nice but tiny village dominated by the military, but the Restaurante Vedeggio has great rooms and good people sharing tapas. Will sleep like the dead tonight. This morning I witnessed something I had never seen. In Nepal, I often encountered woodcutters who not only chopped the trees down with short, curved-bladed axes; they also cut the boards by hand in pit-saws. This morning I watched a helicopter fly back and forth bringing entire cut birch trees suspended on cables to a lumber yard. I have no idea how much an operation like that costs, but the economic differences between alpine Switzerland and Himalayan Nepal are staggering. 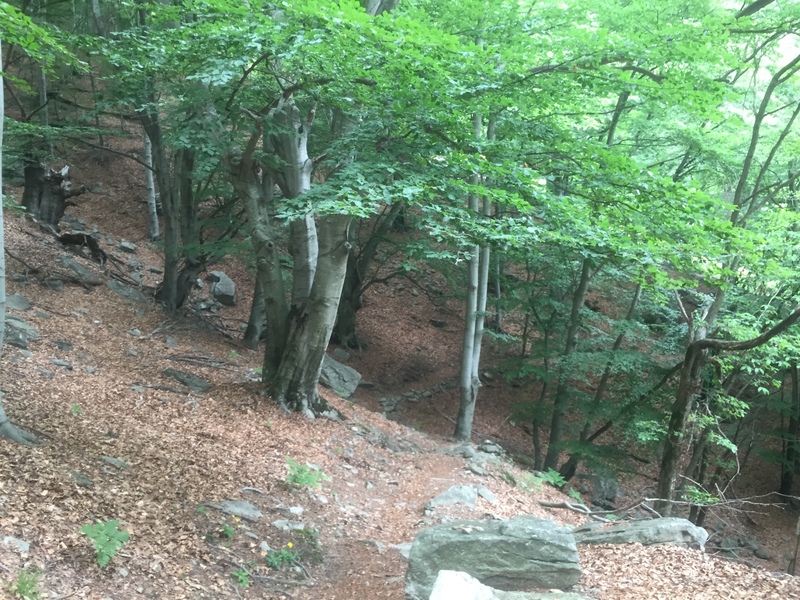 Hiking in Ticino is different than I expected– not that I am sure what I expected. 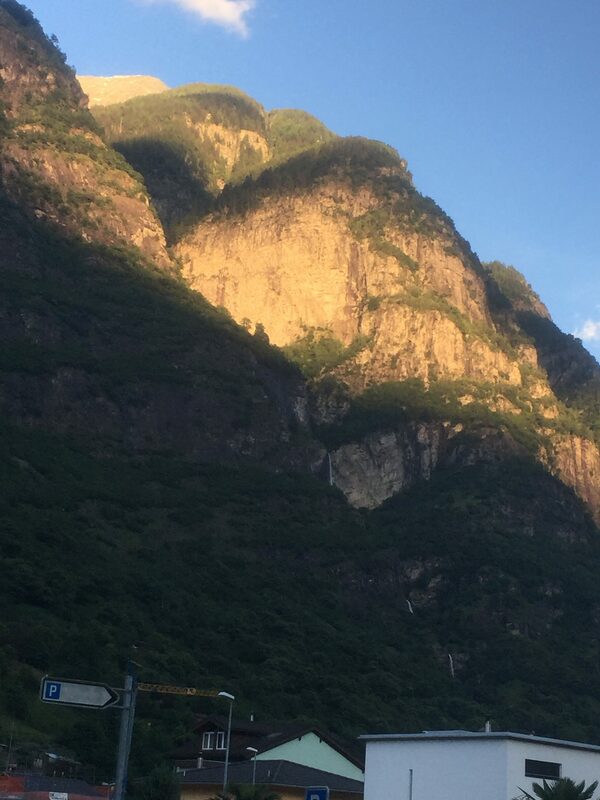 I guess I thought the Alps would level down after Gotthardo pass into Lugano and perhaps they will, but the past two days have been difficult. The trail usually climbs up on a ridge to pass through those villages I described yesterday, but it also keeps shifting from a narrow paved road to a farm track to a faint line across a pasture, to a steep, uneven rocky path that is difficult to follow. Even reading the finger post signs carefully and consulting th several GPS app/maps on my phone, I made several wrong decisions and had to backtrack. Still, lately the hikes have felt a little too scripted, so this morning as I was climbing a long and deeply switchbacked road up to the Strada Alta, I checked the map and decided it was time for an adventure. Climbing off the southernmost tip of a long road switchback, I struck out into the wild. It was clear as long as I kept heading south and climbing, I would eventually strike the road and the upper town, cutting off a kilometer or two, even if I added time. Early on I found a path, though it was more a game trail than something humans made. At one point a large animal scurried away downhill– no idea what it was, but I kept seeing the symbol on the Bern flag in my mind. I scrambled across rocks, slipped on soft tussocks of dirt, had my share of things slide beneath me, but occasionally found traces of a path, and a quick GPS check showed I was not far from the road in either direction. There were tense moments where a slip would have meant a considerable fall, but I usually found a tree or shrub to grab, and was just glad to be pushing things a little bit instead of following blindly some pre-determined path. After one check of the map, I turned due east, climbing straight up the bank at its most steep, slipping and sliding, but before long came upon a human-made trail which led to the road and the village of Anzonico where I would commence the day’s hike on the Trans-Swiss Trail to Biasca. 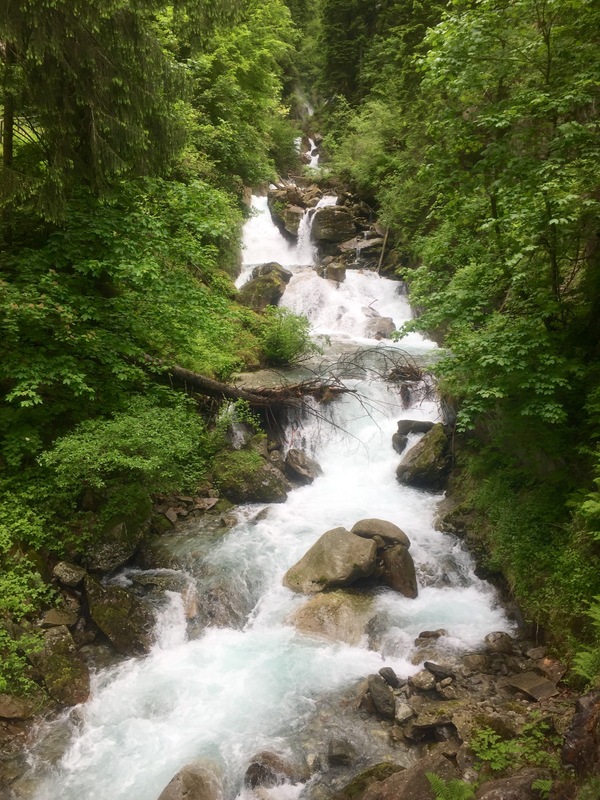 Apart from a missed turn or two, the rest of the day was a magnificent trek wending its way back to the valley floor through old-growth beech forests which, as readers of this blog well know, is my favorite tree to hike under. Yesterday I was complaining about itching nettles, but today it was all bloody scratches from thorns and rocks, marks of a good risky climb. The unstated rules of trail designers are keeping trekkers off of paved roads as much as possible, generally avoiding large towns (unless the trek is a religious pilgrimage), and maximize opportunity for amazing views. Following those rules closely can produce uneven success. Avoiding pavement can at time lead to unnecessary detours up badly made paths while a perfectly good road remains in sight. Sometimes avoiding towns requires long climbing detours to uninteresting places. Today’s walk was a little of that, but also, in parts, the classic example of why those rules apply. 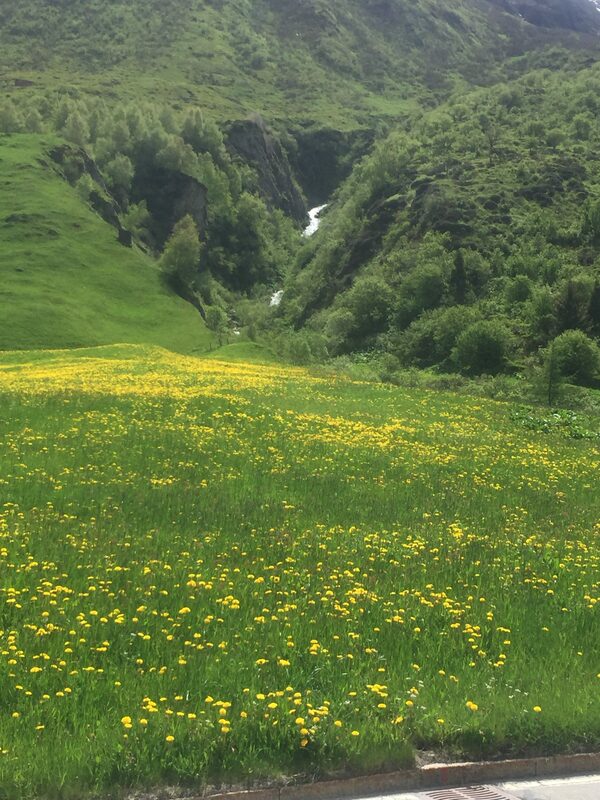 The climb out of Airolo was steep but quick, and I soon found myself on Strada Alta which, when it didn’t dwindle into a narrow path and then a field of nettles, was the perfect path for the day. I found myself walking 3/4s of the way up a ridge, looking down onto the narrow river valley, and across to snow capped alps. The treat though was not the spectacular views but instead the little villages gathered around that high road. Their access was a road no wider than a compact car, as were their main streets, but each had magnificent beamed houses, some in stone, the obligatory water trough with constantly flowing water, a bar/cafe, and a church. Every three km, another would appear. The economy here is less certain. There are farms, but it seems clear that many of the people living in these towns are not farmers. Almost as evidence for this observation, for once I saw as much wildlife as if did domestic. Along with the cows and sheep, I almost stepped on a five foot snake– looked like a black snake but held it head up while moving. Later I scared up a chamois who looked at me for a moment before diving into the bushes. Perhaps the village houses could be vacation homes, or even places for commuters. All very puzzling but beautiful nonetheless. In the town square of one, a young girl sat blowing bubbles that drifted across the trail. I stopped at 1:00 for a pint in a restaurant in one. At first it seemed closed, but on entering I was greeted by a table of locals, already hoisting their day’s second pints and speaking in Italian, a language I love to hear. The bartender had a baby in his arms, and served me a pint of Gottardo, an excellent local lager. Everyone was so happy. I wish my afternoon had been as happy, but as often happens on the trail, a combination of small but significant problems makes for a difficult time. My interlude with the nettles, coupled with some wrong turns– some my fault, others because of the quick change in trail surface (road to overgrown field)– and a long final descent on a sharp rock trail made for a frustrating end of the day. Something remedied by an excellent plate of gnocchi for supper. Crossing a high mountain pass always brings a sense of anticipation. Inevitably the path follows a river which dwindles with the altitude gain. All the while walking, you look at the steam knowing you cannot cross over until it becomes the merest trickle. Gotthard pass is riddled with tunnels, roads, and old paths. Trains pass beneath and climb over. Cars speed on a highway that most of the time is tucked into the rock of the mountainside and roofed with concrete supporting the pasture above that bleeds onto the framework. At lower elevations, animals graze on the roof above the highway. 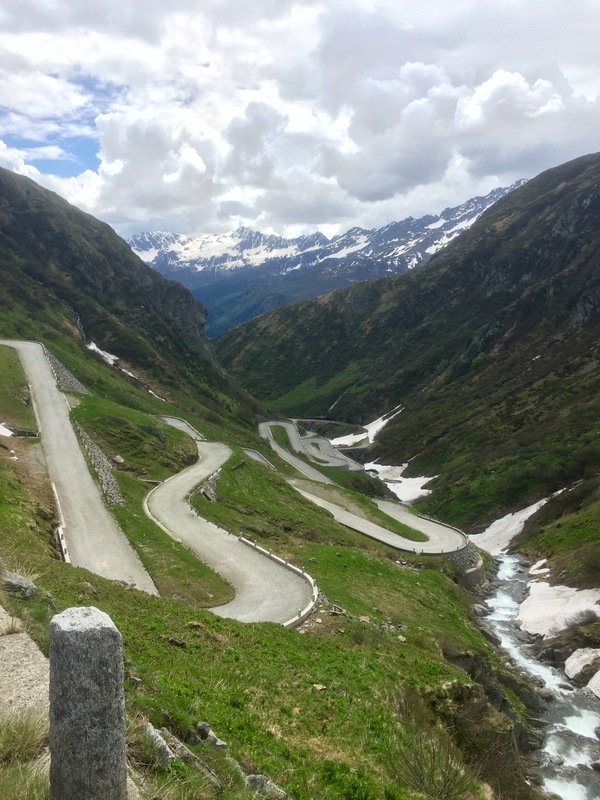 The Trans-Swiss trail alternates between cutting off switchbacks with steep, rocky, narrow paths, and following a now closed old road that is a magnificent example of engineering. The road bed is made of cobbles set in a fan shaped pattern and going on for more than 20 km. On the Ticino side, it twists like overcooked spaghetti, inviting sport car enthusiasts but accepting only bicyclists and trampers. The way up felt long but was gradual with the vegetation waning until it was only rock and scrub. Near the top, the road was drifted over with rotting snow, so I could not see the exact point where the water stopped flowing, though I could feel and hear it trickling beneath the drifts. 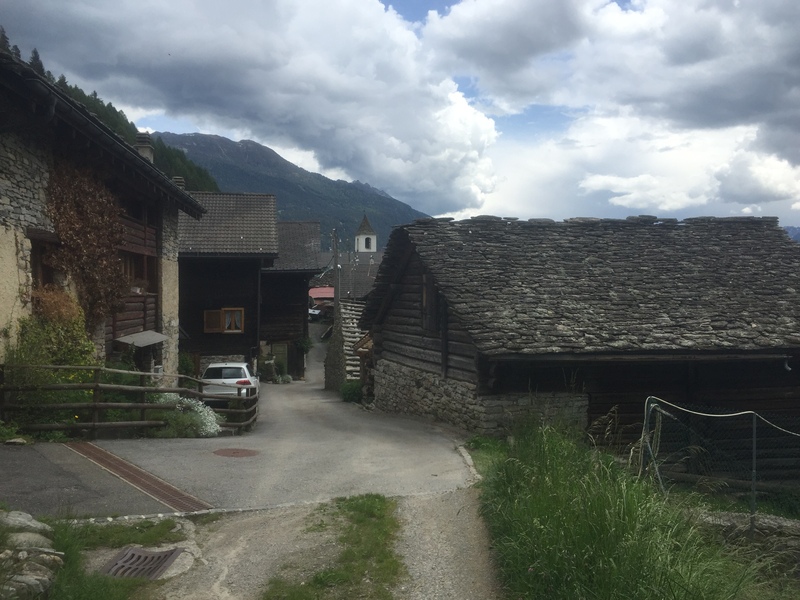 There were points where snowshoes would have helped, but soon I was at the Gotthard Pass village, or now, as this is the Italian Canton, the Gotthardo Pass village. The pass is important politically and economically, but also geologically. The Gotthard massif is the source of four major rivers–the Ticino, Ruess, Rhine, and Rhone–so much of the geography of Europe has its beginnings in that snow I was tramping through today. The source of Hölderlin’s Ister was beneath my feet. Although the walk up the river valley today was glorious, it was hard to cast off a melancholic pall. It was difficult to say goodbye to Bennett. After breakfast (his last Swiss buffet of cold meat, cheese and bread) we rode the gondola down together, parting at the street where he turned back north to his train station and I turned south to work my way back to the trail and then on to Wassen. Much to think about–how my youngest son has become an adult and a friend. At the same time, I kept thinking about the relatively sudden death of an old hometown friend, Ricky Wilkins. Ricky was diagnosed with lung cancer which progressed rapidly, and he died yesterday. He was my brother’s age, so he was two years older than I am, but he always was a character in my youth. Growing up in a very conservative, rural community in the middle of the Vietnam war, it was difficult to get a clear understanding of world politics– particularly one that fit what we were learning as true American values. The news did not seem to line up with the ideal. Ricky was a musician but also was someone with a strong political conscience– something that was difficult to formulate and hold in that time in the Shenandoah valley. I remember well the universal condemnation there of Muhammed Ali (then Cassius Clay) when he refused draft induction. It is telling that they died on the same day. I learned from Ricky as a young man what was at stake when you took a view contrary to the political consensus, even if it was clearly the correct one from any moral stance. I left Woodstock Virginia in 1974, pretty much never to return, and so lost track of Ricky and his musical peregrinations which included a long stint in Nashville. We reconnected a few years ago through social media where I found he was still fighting the good fight against social injustice and bigotry, and he was still a musician, bringing people together through a medium that has the real strength to do that. In the summer of 2012, when Bennett and I were hiking the Virginia section of the Appalachian Trail, Ricky and I were in contact trying to see if we could coordinate a time for us to come off the trail to hear him and Amanda perform. It is hard to project times well when you are hiking distance and, by the time we got to Shenandoah county, he was playing elsewhere, so I missed my chance for that reunion. Now it seems I’ve missed it completely. My thoughts are with Amanda and their children today.